On-line Digitally signed e-tenders are invited in two Bid Systems from reputed and experienced manufacturers/authorised dealers for Supply and Installation of Video Wall with narrow bezel 55” display and 4 output controller as per Council’s specification. Only reputed manufacturers having proven experience in producing similar product and capability to execute the job within scheduled time frame may download the tender documents from the Central Public Procurement Portal (CPPP): http://eprocure.gov.in/eprocure/app or from the Council’s websitewww.ncsm.gov.in. 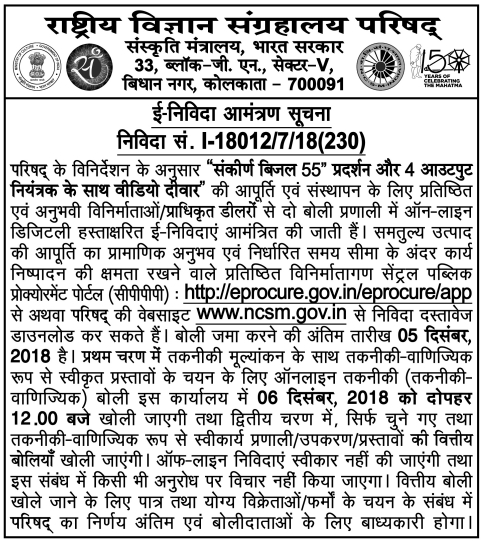 Bid submission end date is December 05, 2018. Online Technical (Techno-Commercial) Bid will be opened at the first instance in this office on December 06, 2018 at 12 p.m. for technical evaluation as well as selection of techno-commercially acceptable offers and at the second stage, the Financial Bids of only the selected and techno-commercially acceptable system/equipment/offers shall be opened. Off-line tenders shall not be accepted and no request in this regard will be entertained whatsoever. Decision of the Council regarding selection of eligible and qualified vendors/firms for opening the Financial Bid shall be final and binding on the bidders.